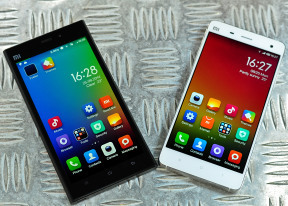 The Xiaomi Mi 3, one of the most popular smartphones in China, is up against its own successor, the Mi 4. Two generations ready to clash: boxes opened, benchmarks loaded, audio on, cameras rolling, batteries charged. The Xiaomi Mi 4 has more RAM and a third-gen Snapdragon 801 chipset, along with LTE connectivity - all that in a slimmer, more compact shell. The upgraded specs go with an entirely new look with a handful of exchangeable rear covers to choose from. The Mi 3 on the other hand is powered by the previous version of that same chipset and is still a perfectly good package for the price. The big things missing are 4G data and 4K videos - both easily rendered irrelevant if a) there's no LTE network where you live or b) you go for the 16GB version. With things like Gorilla Glass 3 and NFC surprisingly missing, is the Mi4 worth the upgrade? In a matter of hours we'll be reminded again of the difference between one particular phone and all others. Six full editions thereof and a couple of in-betweens - blessed and cursed, loved and hated, admired and imitated. Made in China, to the very last one. The reminder we need though is that the difference between Chinese (as in "Can't pronounce the brand name") and the "Made in China" stamp on the back of an iPhone isn't what it used to be. A vast market with soaring smartphone demand, the growth of 3G and 4G networks, combined with improved skill and expertise, have seen a number of Chinese makers emerge from the pack with self-awareness and confidence. Xiaomi has a prominent spot on that shortlist and plenty of reasons to be called "Apple of the East", both right and wrong. Still one foot in the copycat phase, but a couple of generations of flagships too that can compete with the best of them. Now, they'll compete against each other for a change. So, Xiaomi has two smartphone generations in less than a year, impressively equipped and competitively priced. They're officially meant for the Asian Pacific region, the domestic market probably the main target, but the build quality and features for the price will get enough attention elsewhere. Both devices are available as we speak at less than $400 for the Mi 3 and $500 for the Mi 4 - that's the price of the 64GB version. The upgrade comes in at a little over $100 - more than a reasonable premium if you can make the best of the LTE and the 2160p video. That makes the Mi 3 the budget option but the obvious underdog has enough going for it. As usual, we'll try to look beyond the dry specs and put things in perspective. Our side-by-side hardware comparison follows right after the break. Special thanks to HonorBuy for providing the review unit. mhl wired connection for mi4 ? any one has try this or just rummor? on amazon there is some seller https://www.amazon.com/MHL-Micro-USB-conversion-­official-chipset/dp/1060697335 but denied by member on miui mi4 forum?